What is the best skincare routine for acne prone skin? Are facials good for acne-prone skin? 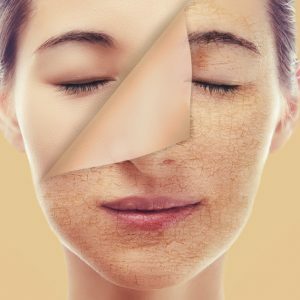 ‘Clogged pores’ is a phrase you’re going to come across one too many times in this article since that’s the key principle of caring for acne prone skin. Clogged pores – caused due to overproduction of oil that traps dirt and dead skin cells – is the main cause of acne. 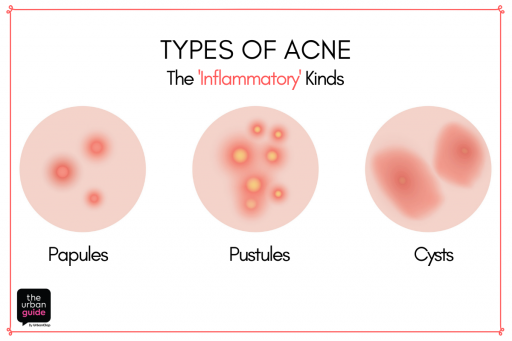 But before we proceed to skincare routines, it’s important to identify your acne type. 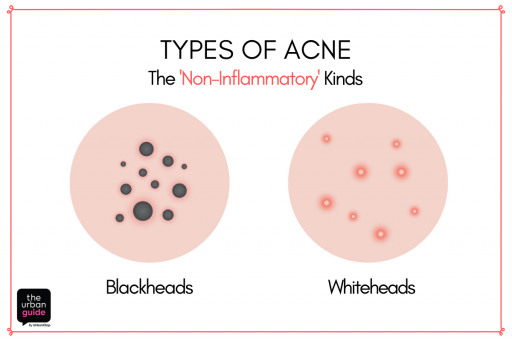 Non-inflammatory acne is the most common kind of acne. It is distinguishable by blackheads, whiteheads, and tiny bumps under the surface. In this case, the pores are simply blocked with oil and can become habitats for bacteria to grow. Inflammatory acne causes hardened non-pus pimples, pus-filled pimples called pustules, and hard bumps or cysts. This happens when clogged pores get infected with bacteria. 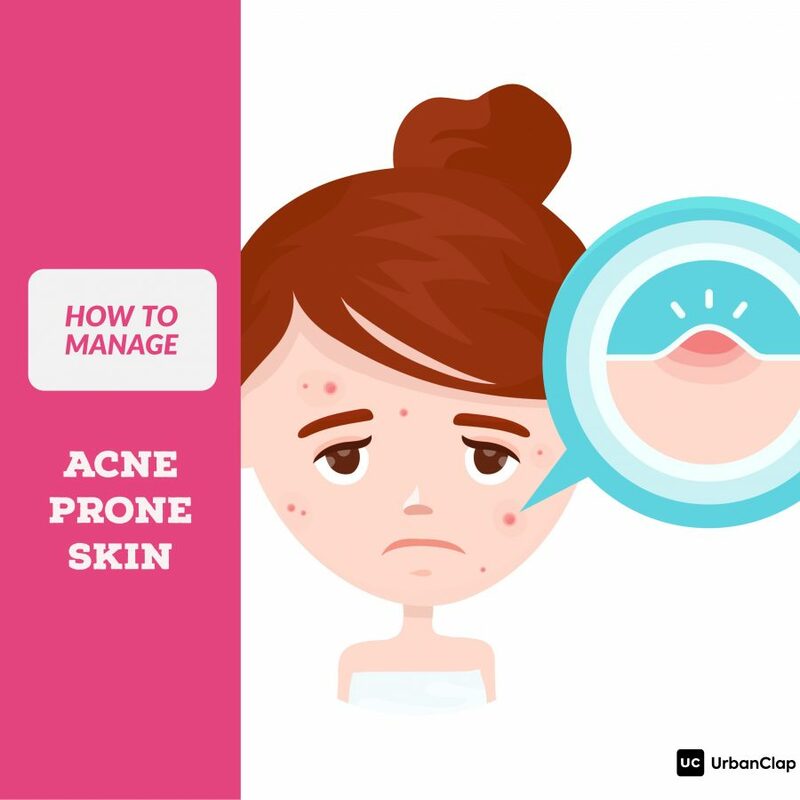 This acne type usually needs skin care products recommended by a dermatologist. Acne-prone skin is also sensitive, so use an ultra mild cleanser that won’t irritate the acne. 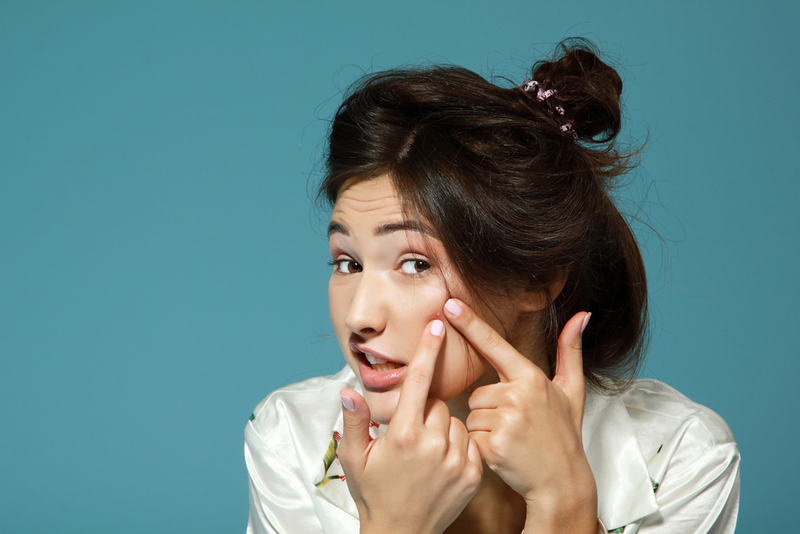 Two key ingredients to look for are salicylic acid that unclogs pores of oil and dirt, and benzoyl peroxide that fights pimple-causing bacteria. Salicylic acid-based cleansers work best for non-inflammatory acne like whiteheads and blackheads, while acne soaps with benzoyl peroxide soaps work well for inflammatory acne. Using a moisturiser on acne-prone skin may seem like a crazy idea. The truth though, is that most acne cleansers and toners are made to dry the skin in order to control the acne. The dryness, in turn, can push the cells to secrete excess amounts of oil or sebum. The result is more clogged pores! This is why moisturising is vital to treating acne problems. Look for a non-comedogenic formula, that won’t clog the pores. Gel-based moisturizers with mineral oils and dimethicone keep the pores clear while helping your skin retain its natural moisture. Don’t be too worried about adding another layer of ‘cream.’ Sunscreens are essential for all skin types, whether they are acne-prone or not. Besides, tanning would only cause the blemishes to look starker. Again, look for gel-based, non-comedogenic sunscreens that will protect your skin without clogging the pores. Wash your face with the cleanser, just like in the morning. Stick to washing your face not more than twice a day since excessive washing will only over-dry the skin and cause more breakouts. There are many beliefs out there regarding what toners can and cannot do. To simplify things, think of toners as the second round of cleansing. Add a few drops of toner on a cotton ball to wipe off the remaining dirt, and traces of makeup from your pores. Opt for tea tree oil toners that will unclog your pores and reduce blackheads. Since overuse of toners can rob your skin of essential natural oils, it’s best to use it just once a day. In case your skin is extremely oily, you could use toners with alcohol to absorb excess oil. The jury is out on whether acne-prone skin types should use scrubs or not. On the one hand, scrubs are great for removing dead skin cells. On the other hand, they can irritate the skin and cause more breakouts. We suggest using a very mild scrub with fine particles. You can even add baking soda to your face wash. While all the other products work towards keeping the pores clear and regulating the oil balance, Spot treatments are highly concentrated amounts of salicylic acid/benzoyl peroxide that work at reducing pimples and acne and lightening scars. You can even use a face serum with Vitamin C, retinol, and AHA. Re-Hydrate your skin with a moisturiser to counter the drying effects of cleansers, toners, and face masks. Acne-prone skin types should apply a mud or clay face mask on the days you scrub. There is a slight difference between mud and clay masks. While clay masks absorb excess amounts of oil, mud masks go a step further to soothe redness and treat acne. Choose your type of face mask accordingly. What is the best skin care for acne-prone skin? Acne-prone skin types should be careful about keeping their pores clear. Clogged pores, due to excess amount of sebum or oil, lead to acne, blackheads, and pimples. The best skincare for acne-prone skin works towards keeping the pores clear by using non-comedogenic skincare products with acne-fighting ingredients like Salicylic Acid, Benzoyl Peroxide, Retinol, Tea Tree Oil, Clay, Sulphur, and Witch Hazel. Yes, certain moisturizers can cause acne by blocking your pores. Blocked pores host environments for bacteria to grow and cause infections i.e. acne. 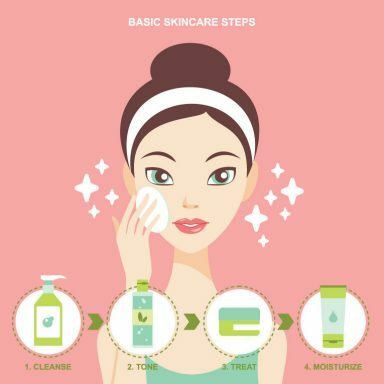 However, moisturizers are also an important part of the skincare routine since they counter the excess dryness caused by cleansers and toners. Look for non-comedogenic moisturizers that will moisturise the skin without clogging the pores. Is facial good for acne-prone skin? 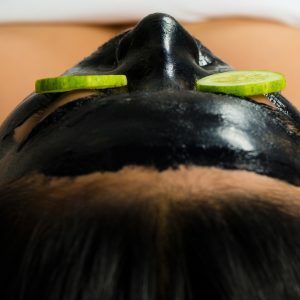 Facials have multiple benefits for acne-prone skin – they clean out the pores thoroughly; the facial massage leads to better blood circulation, which in turn helps your skin heal and repair faster. However, make sure your beautician does not use scrub over the acne since this will cause more breakouts. She should also avoid steams since too much heat irritates the skin too. Ask your beautician for special facials for acne-prone skin that has products suited for your skin type. 2 Face Masks for Dry Skin | 6 Simple Recipes for the Lazy Girl!